As young boys exploring the shores of Tod Inlet, ten year-old David Gray and his brother Jamie accidently discovered a nearly forgotten part of Canada’s history. Intrigued by finding pig’s skulls in the banks above Tod Creek, they began digging farther into the past, finding artifacts documenting the abandoned community of Tod Inlet. From the fragrant leaf-littered soil the boys pulled out pig’s teeth, old leather boot soles, ivory toothbrushes, and Chinese coins and pottery. Facinated and curious about these items, David began asking the local “old-timers” about the history of the inlet. As a teenager, he began a more serious search into Tod Inlet’s story. Over the years, research in the archives in Victoria and Ottawa, and interviews with former cement plant workers led to an awareness that there was an important story to be told. Additional archival research and the interviewing of local elders was made possible by a British Columbia Heritage Trust grant to the Citizens Association to Save the Environment (CASE) of Victoria. 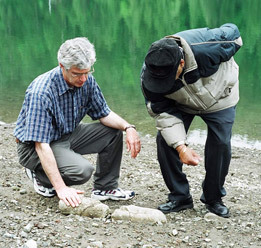 In the 1990s David finally encountered and interviewed descendants of the Sikh and Chinese workers of Tod Inlet. A preliminary account of the workers of Tod Inlet was published in the magazine This Country Canada in 1996. In 1998 David was awarded a research grant by the Royal Canadian Geographical Society to cover the research costs of the production of an historical map of Tod Inlet.